Happy New Year! 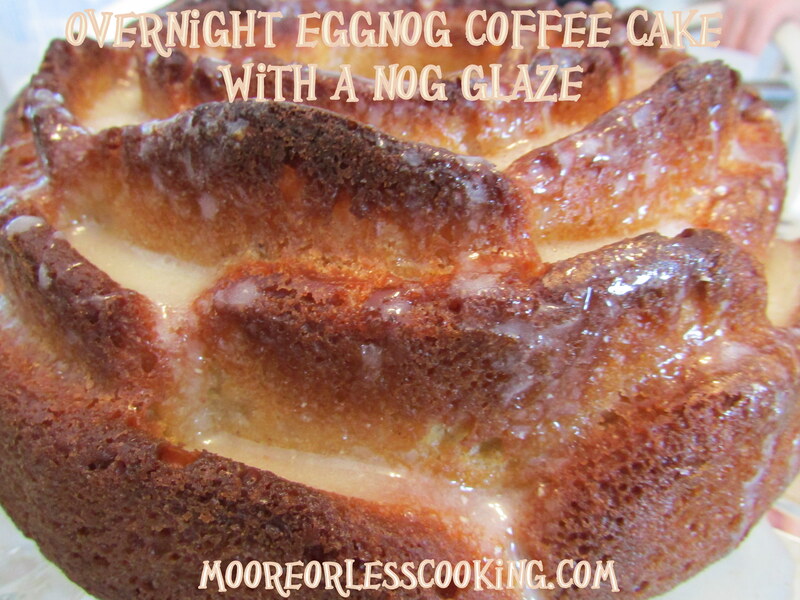 Best way to start your new year is to cut into this Eggnog Coffee Cake! Well it was for me! Let the batter set overnight, makes an easy morning breakfast. Bake it the next day! Unless you have set your coffeecake batter in a deep freeze sun room like mine, add a bit more time to the baking. I used a pretty Rose Bundt Pan, so that it would look festive for our beautiful occasion! This is an incredibly moist cake, perfect for an open house New Year’s day party, or just because! Grease 12 – cup round molded cake pan with shortening. In large bowl, beat 1 cup granulated sugar and 1/2 cup butter with electric mixer on medium speed, or mix with spoon. Beat in 1 cup eggnog, the sour cream, rum extract and eggs until blended. Stir in 2 1/2 cups flour, the baking powder, baking soda and salt. Spread in pan. Cover and refrigerate for at least 8 hours. Pre Heat oven to 350°F. Uncover pan; bake 25 to 30 minutes or until toothpick inserted in center comes out clean. Cool 10 minutes then flip out onto a rack and cool completely. In small bowl, mix all Eggnog Glaze ingredients until smooth and thin enough to drizzle. Drizzle over coffee cake. Nettie!! You are making me drool all over my laptop! This looks A-MA-ZING!